Our Rifle, Carbine & SMG Universal Magazine Pouches are not only rugged and durable, but highly versatile as well. Capable of carrying nearly any Military or Law Enforcement rifle, carbine or SMG magazine, they are the perfect choice for users who deploy a wide variety of weapon systems. 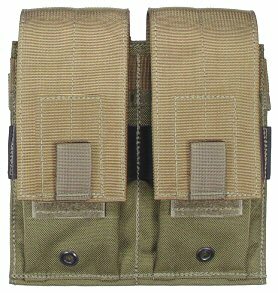 With these pouches you are capable of building one load bearing rig for all of your needs. Adjustable flaps which allow either (4) 30 round 5.56mm magazines, (2) 20 round 7.62x51mm type magazines, (2) 30 round AK-47 magazines or (4) 30 round 9mm SMG magazines to be carried in the pouch. MOLLE/PALS compatible Specter Snap attachment system which is fully compatible with current MOLLE/PALS load bearing equipment. Pouch body constructed with an outer layer of 1000 denier Cordura nylon with a 420 denier packcloth inner layer. Black oxide # 0 drain hole grommets. Vertically oriented flap pull tabs for more positive flap access and release. EVERY SPECTER PRODUCT is backed by a lifetime warranty. Because we know what is at stake. Voodoo Tactical Padded Four Weapons Gun Case 46"